(Open Box) High track capacity in a portable recorder. 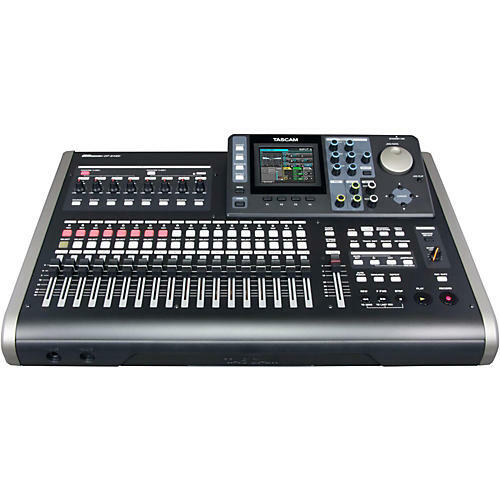 Along with their inventory of smaller portable recording studios, Tascam maintains a line of more elaborate, detailed and capable all-in-one console recorders. The Tascam DP-24SD is a stand-alone tabletop recording studio that records 24 tracks to built-in solid state recording media. No fussing with onboard CD burners, cards and data transfer. The hard drive is built right into the recorder. Along with the convenience and power of an internal hard drive, the DP-24SD has a mountain of essential features that will help you present your productions with a professional sheen and clear, intelligible audio. The DP-24SD has 12 tracks that are selectable between MONO and STEREO. Set to STEREO for recording synthesizer, or set to MONO when recording live guitar or vocal. Not only that, you can create ideal settings for each track.Even with its high number of tracks and rich features set the DP-24SD is one of the easiest to use multi-track recorders on the market. The DP-24SD has 19 track faders and one master fader. Order today and generate broadcast-quality recordings at home.